One of the most important actions we can take to protect our environment is to develop a sense of place. In understanding the place where we live, its history, its watershed, its landscapes, its native flora and fauna we see it as part our own identity, something that we care deeply for and are inspired to protect. Come celebrate the New Year with CASLC - From Inspiration to Action: We Can Make A Difference in 2019! We will open with “meet and greet” time, which will include snacks and beverages. Following we will review of 2018’s accomplishments and the projects on our “to do" list for 2019. At this time we ask our supporters to sign on with committees working on these projects: creation of a county watershed map; conservation of land, and protection of water quality and species habitat along the North Fork of the St. Lucie River; anti-plastics campaign; interface with local governments' staff and elected representatives; advocating against bio-solids applications; one-day seminar on climate change. We will discuss available positions as well. It’s a big wish list but we live in challenging times. The quality of our natural ecology and the our children’s future depends on us getting involved in whatever way we can, large or small. With your assistance the Alliance can continue to be a vehicle to make a critical difference. General Meeting - From Inspiration to Action: We Can Make A Difference! General Meeting - Lets Talk About Second Chances! Nearly 1.4 million people in Florida, who have served their time and paid their debt to society, are permanently excluded from voting. These Floridians have earned the right to participate and give back to their communities. Passage of Amendment 4 – the Voting Restoration Amendment -- will return eligibility to vote to people who have completed their full sentences – including parole, probation, and restitution. The amendment specifically excludes those individuals who have committed murder or a sexual offense. Olivia Nedd, of Florida Conservation Voters Education Fund, will join us to talk about why FCV believes supporting this amendment and bringing more voters to the polls is so important. In addition she will share an update on the group’s Climate Action and Voter Registration initiatives. The meeting will be held at our usual meeting spot at SELF's mini-auditorium in Fort Pierce. See address and directions to the right. One way we can protect the Indian River Lagoon and our other waterways is to communicate to our elected representatives the importance of our ecosystems. We need healthy ecosystems for a sustainable and productive economy. With the 2018 elections fast-approaching, we have been asked to provide a platform for several candidates. We are a not-for-profit- nonpartisan 501(c)3 organization and thus can not endorse any candidate but can take this opportunity to ask candidates their views on the state of our environment in St. Lucie County and what their plans are, if elected. The meeting will be at our usual meeting spot at SELF’s mini-auditorium in Fort Pierce. Please see address and directions at the right. July 27 & 28 - from 7:30 - 10:00 pm each night. MOONLIGHT ACOUSTIC TOUR ON THE INDIAN RIVER LAGOON with Dr. Grant Gilmore, Ph.D. Nationally renowned fish scientist, locally revered fish whisperer. NOTE: There will be NO General Meeting in July. We will begin with the inspirational and humorous TED talk video, “How I Fell in Love With a Fish.” This is a great example of a new paradigm that is ecologically-based, and from which we can make better decisions as we engage in our work of conservation and protection of our environment. 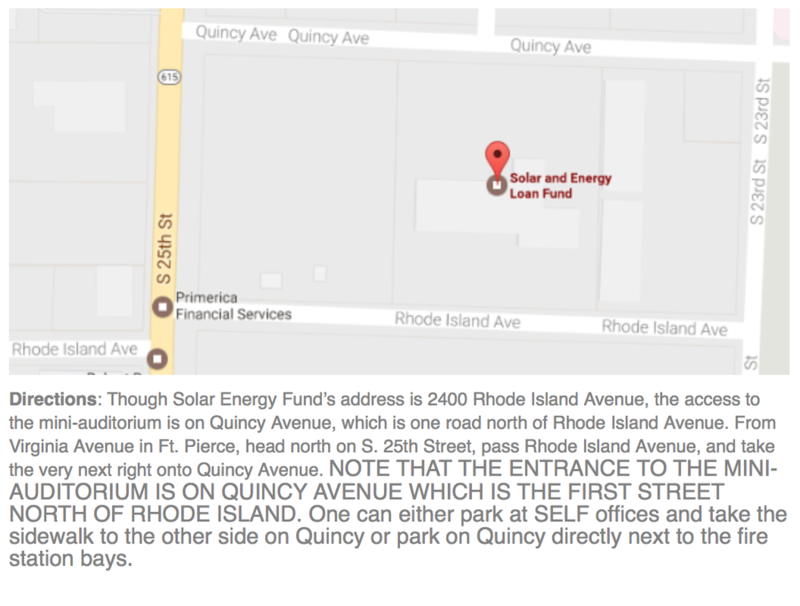 Directions to the Solar Energy Loan Fund Auditorium (where most general meetings are held).